GZA members enjoyed their tour of the Topsy Turvy Bus at the Green Israel Summit this past October. NEW YORK (Feb. 11, 2011) — Long past December, this year’s Chanukah miracle is that the oil is still burning. Fueled by cooking oil first used during the Green Zionist Alliance’s Chanukah party at Greenpoint Shul, the Topsy Turvy Bus begins its third Jewish environmental tour today in Raleigh, N.C. The GZA’s Chanukah oil alone, though, may not have gotten the bus past Delaware, and the miracle would have stopped there. But scores of people and about a dozen co-sponsoring organizations have donated to help make this bus tour, run by the Teva Learning Center, a reality. That includes building solar ovens out of used pizza boxes and teaching about waste through an on-bus worm-composting bin and the bus’s used cooking-oil fuel-processing unit. And, of course, Judaism plays a big role in their lessons. Do you want to learn more in person? Meet up with the Teva crew on their East Coast tour. Or, better yet, you can bring Litwin, Cossin, the four other amazing Teva educators, and the eye-catching Topsy Turvy Bus to your community by contacting Teva. The first two Jewish environmental bus tours, under the auspices of the Jewish Climate Change Campaign, were in 2009 and 2010, but the Topsy Turvy Bus actually has a long history of social activism. Designed by Stefan Sagmeister and assembled by a Massachusetts company at the behest of Ben Cohen of Ben & Jerry’s, the Topsy Turvy Bus originally wasn’t topsy turvy, but it still stood out. A yellow double-decker school bus, in June 2002 it began its first cross-country mission in Vermont in the service of TrueMajority, the liberal-advocacy nonprofit Cohen founded in the beginning of his post-ice cream years. The double-decker bus called for the doubling of federal education spending. As part of a contingent of funny-looking vehicles in the TrueMajority fleet, though, the bus was overshadowed by its pink piggy bank-shaped cousins in its first cross-country adventure. In 2007, the late California art-car maker Tom Kennedy and a team of Bay Area-based Burning Man artists, commissioned by Cohen and inspired by Sagmeister, combined the bus with another school bus to create its current topsy-turvy form, representing the topsy-turvy nature of the U.S. military budget and U.S. spending on education, health care and the environment. The idea was that their respective spending ratios should be flipped. Helmed by Kennedy and his wife, political performance-artist Haideen Anderson, the bus returned to the road alone, pigless, as the star of a pre-election cross-country trip from California back to Vermont. 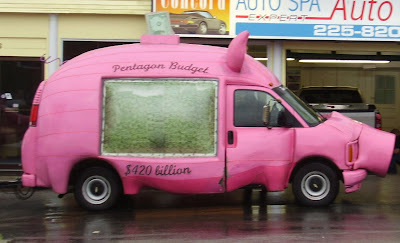 As the presidential political primaries got rolling, the Topsy Turvy Bus hit the campaign trail, joined once again by the pig cars as well as a carnival car, an OreoMobile, and a car that carried large pie charts of the federal budget. The bus traveled cross country under the flag of Priorities Campaign, a project of the Cohen-led Business Leaders for Sensible Priorities, which in turn has since become part of the Center for American Progress. The next year, food-justice activists Daniel Bowman Simon and Casey Gustowarow acquired the bus and drove it cross country for TheWhoFarm (The White House Organic Farm Project), advocating that an organic garden should be planted at the White House. 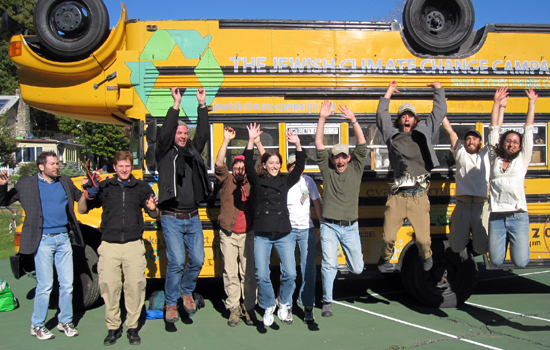 After their successful campaign, they donated the bus to the Teva Learning Center, which has been using it as a mobile Jewish environmental-education classroom ever since. After all these years, the Topsy Turvy Bus is needed now more than ever: Why is that collectively we have no problem spending trillions of dollars on entertainment, but the idea of a carbon tax gives us fits? Why is it that the big solar-energy facilities in places as far-flung as California and Spain are being built by Israeli companies but that Israel itself continues to be powered by coal? And why do we continue destroying our environment when we depend upon it for our very existence? It’s a topsy-turvy world indeed. Thankfully, Teva’s Topsy Turvy crew is back on the streets, doing what it can to turn this world back right side up. David Krantz is the president and chairperson of the Green Zionist Alliance. "Behold land, for we hath squandered." In the next 30 years, ground pollution is projected to contaminate more than 75% of the water wells in the greater Tel Aviv area.